Adopting native wood powder as the raw material, the wood PLA filament is an advanced composite material and features non-corrodible, moisture- resistance, moldproof, anti acid and alkali. The 3D printed product is close to the effect of solid wood, emitting the aroma of wood while using. The wood PLA filaments are unique for having the characteristic of real wood, can be nailed, drilled and carved. 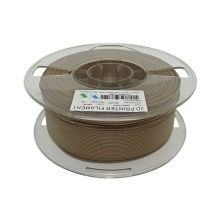 Made of biodegradable eco-friendly material, the wood PLA filament is suitable for medical treatment, teaching, food industry, architechtural design and other fields. Perfect printing effect — the model printed out has smooth surface and precise color, instead of warping edge and bubbles. Compared to other normal filaments, the wood PLA filament is easier to shape and maintain, high temperature resisting and no plug. Tests shows that the wood PLA filament can be used smoothly more than 300 hours without blocking. Available for nozzle in size 0.4mm, perfect for nozzle in size 0.5mm.